You can use Operate’s editor to create templates for any type of document that you might want to use within your business, in relation to your workspace, your customers, sales or billing. 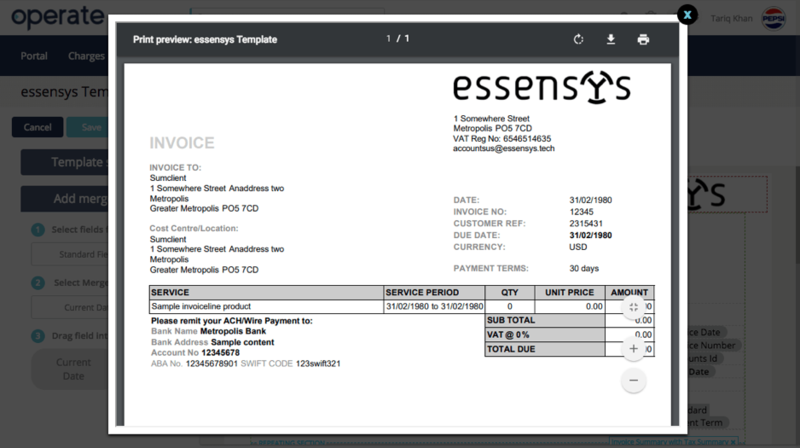 While Operate provides specific features for creating key documents such as invoices or licence agreements, the more general document template features allow you to create any type of document that you might need. There are two types of documents that you will already find preconfigured: The Standing Order Document and the Direct Debit Document (which you can use to send direct debit collection information to your bank). To get started creating templates for your documents, go to the Settings > General >section, then select Templates > Document Templates. To create a new template, click the New button, at the top of the list. On the next screen, Operate will give you the option to start from scratch, using a blank layout; or select one of the pre-existing templates, which you can change according to your preferences. For the purpose of this guide, we will start with a Simple Standing Order template. Click Add Merge Fields to expand the options. Here is where you can add fields to your document. First, select a field category, then select a merge field. In our example, we are looking into the Locations category and we are adding a Location Entity field. Now that the field is selected, all you need to do is click and drag it onto the invoice layout, wherever you want to place it. Please see the demonstration below. Save your template when you are happy with it. Your document will be immediately available for use. To preview your template you can use the convenient print preview feature. This should alleviate the pain of guessing where page breaks naturally occur. It does not provide a preview of what the mergefields translate to, but does provide a very accurate illustration of how your document would appear once printed on paper or attached to an email as a PDF document. Mergefields are replaced by sample data.